The Auphonic Batch Productions interface allows you to start multiple productions with an existing Preset at once and can be used for file-based, automated batch processing of audio file collections. Metadata, chapter marks and cover images will be imported from input files in empty fields. For more complex use cases you can also use the Auphonic API. For bigger datasets and customization see Managed Processing of Audio and Video Archives. Select your audio or video input files and an existing Preset. All input files will be processed with settings from the preset! You can upload your files directly in the browser, use HTTP links or any supported External Services (FTP, Dropbox, S3, Google Drive, SFTP, WedDAV and many more - please register the service first). MP2, MP3, MP4, M4A, M4B, M4V, WAV, OGG, OGA, OPUS, FLAC, ALAC, MPG, MOV, AC3, EAC3, AIF, AIFC, AIFF, AIFFC, AU, GSM, CAF, IRCAM, AAC, MPG, SND, VOC, VORBIS, VOX, WAVPCM, WMA, ALAW, APE, CAF, MPC, MPC8, MULAW, OMA, RM, TTA, W64, SPX, 3PG, 3G2, 3GPP, 3GP, 3GA, TS, MUS, AVI, DV, FLV, IPOD, MATROSKA, WEBM, MPEG, OGV, VOB, MKV, MK3D, MKA, MKS, QT, MXF. Please let us know if you need an additional format. It’ possible to set individual titles, track numbers, output filenames, subtitles, summaries and Chapter Marks. Select a Text File Format with a timepoint (hh:mm:ss[.mmm]) and a chapter title in each line or Import Chapter Mark Files from Audio Editors. 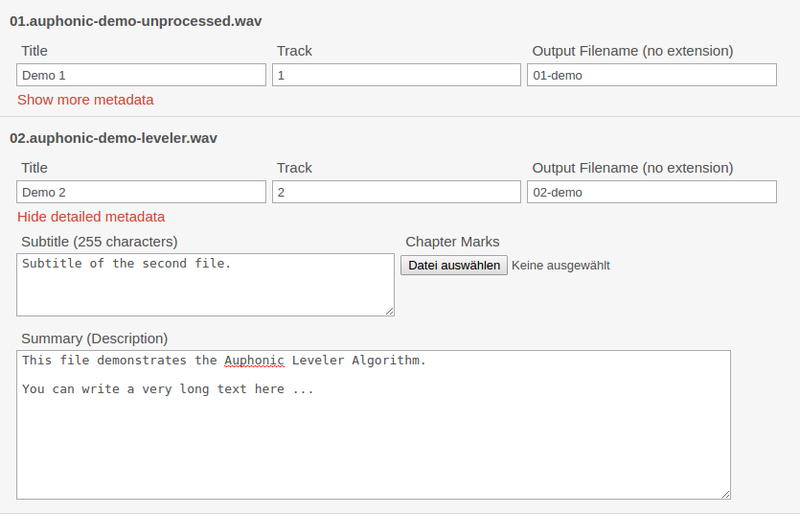 NOTE: We automatically import Chapter Marks form your input audio file!